Koenraad Dedobbeleer, Faux blonde, 2016, Not Enough Past to go Around, 2012, Too Quick to Dismiss Aesthetic Autonomy as Retrograde, 2012, Various Difficulties Entailed in the Act of Recollection, 2009. “Boredom won’t starve as long as I feed it”: Koenraad Dedobbeleer’s exhibition of sculptures and artistic interventions in the Esters Villa in Krefeld, designed by none other than Ludwig Mies van der Rohe, is rather perfidious. Interacting with the architecture, the works give rise to a complicated, multi-layered referential system. The objects that the artist (born 1975 in Halle, Belgium) has created seem somehow familiar, yet at the same time always appear seeking to be something different. They are riddled with subtle allusions, ironic commentaries, and art-historical references. Dedobbeleer changes the structure of everyday objects, their dimensions, materiality or colors – often by means of only minimal interventions – and thus extracts them from their original functional context. He does this in order to put their visual and cultural qualities to the test in the world of art. 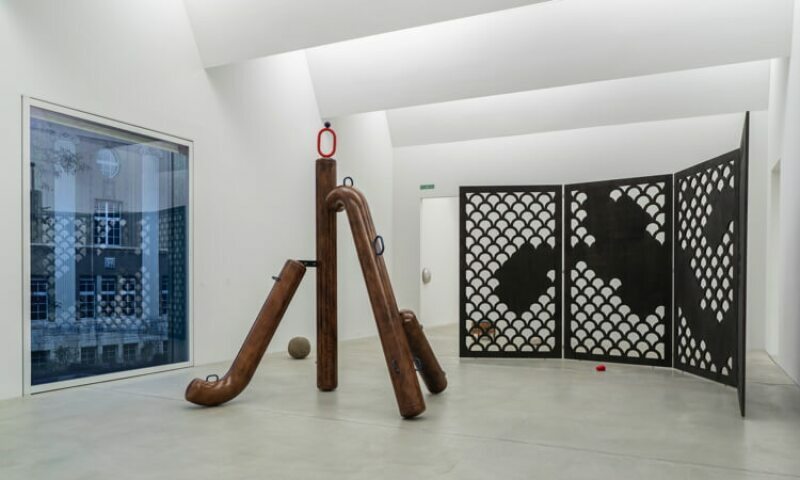 Not least his exhibition titles reflect this idiosyncratic sculptural approach, which draws on the lineage of sculpture, design and everyday culture. Dedobbeleer’s oeuvre has been featured in countless solo shows, among others at FRAC Bourgogne, at Kunsthalle Bern (together with Rita McBride) and at Museum Abteiberg, Mönchengladbach. In 2009 he won the renowned Mies van der Rohe Award in Krefeld. The exhibition at Kunst Museum Winterthur is the first extensive presentation of his oeuvre and is being organized in cooperation with WIELS – Centre d’Art Contemporain in Brussels and Kunstverein Hannover. The exhibition will be accompanied by the first monograph on his work, which is being brought out by Koenig Books: Kunststoff – it is both surprisingly linguistically sober and yet truly profound, in this way complementing Dedobbeleer’s artistic oeuvre.